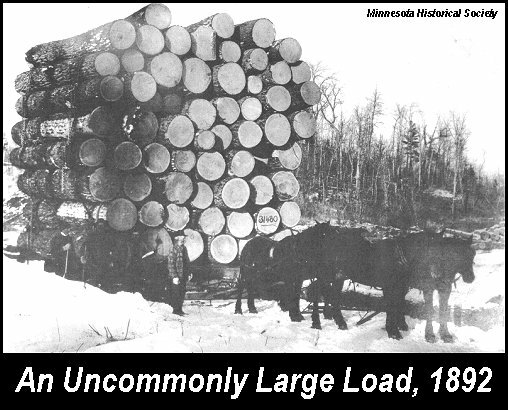 The great logging era is, perhaps, one of the most famous periods of growth in the United States. Early American settlers viewed the forest as either a barrier to development or a source of rapid wealth. As the forests of the east were depleted, logging companies moved west into the Great Lakes area. 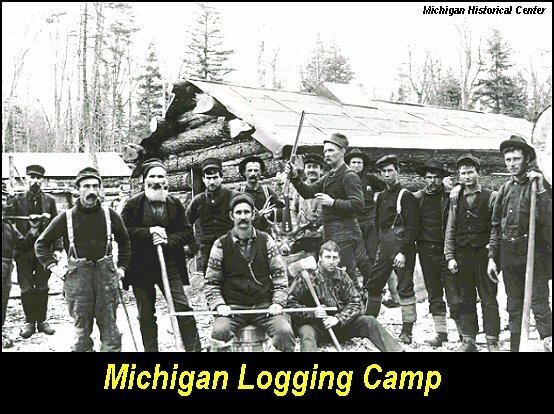 From about 1840 to 1900, most of the Michigan forests were cut down for farms and to produce lumber for buildings, ships, and mines. 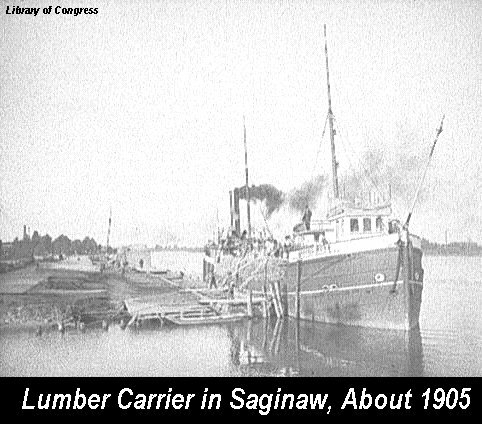 Michigan was the nation's leading lumber producer between 1869 and 1900. In early days of logging, there were few roads. Logging companies built "camps" and brought in crews. Most of the cutting was done in the winter when it was easier to move the logs to water. After the spring melt, the logs were floated down rivers and across lakes to sawmills. 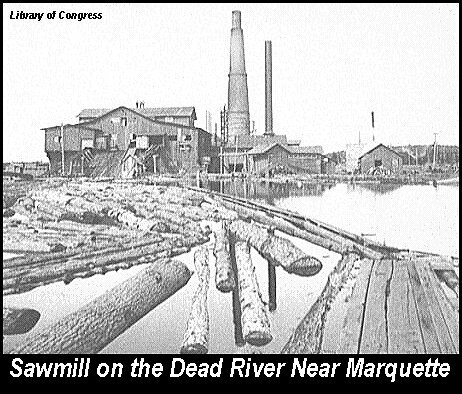 The first sawmill was built in 1832 at the mouth of the Menominee River in the Upper Peninsula. The sawn lumber was loaded onto ships and carried to markets. At first, just the pines, especially white pine, were harvested. It makes really good lumber and would easily float! Most of the hardwood species have denser wood and would just sink and be lost. Remember, there were few roads and railroads at that time. All this work was done by human power and horse power. Men used axes and long cross-cut saws. It is amazing how much wood was moved using these simple technologies! 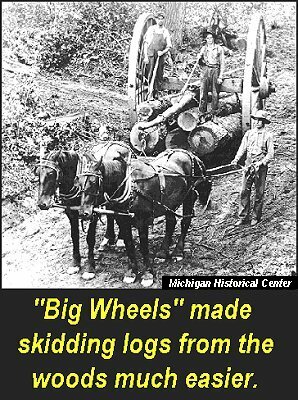 The invention of the "big wheels" made hauling logs out of the woods much easier and faster. Later on, railroads were used to transport logs. 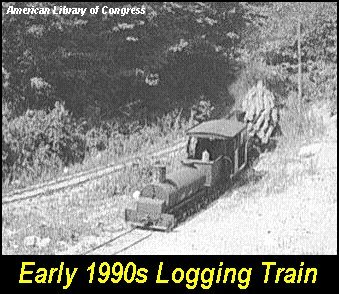 Many special railroad lines were built to carry logs out of the forest to sawmills and mines. In the Upper Peninsula, the smelters for copper and iron used a lot of hardwood for fuel. The forests were one of the main reasons many people came to Michigan. How much wood was cut during the logging era? Well, the exact figure will probably never be known. 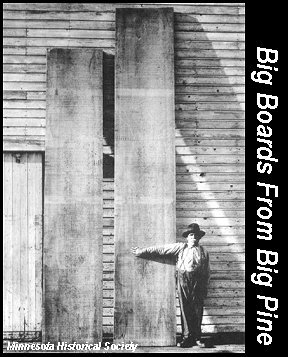 By 1897 over 160 billion board feet was logged from Michigan forests. Today, the forest has about 70 billion board feet of sawtimber. If 160 billion board feet of logs were laid out in a pile four feet high and eight feet wide, it would go around the world about 50 times, or to the moon and back about five times! The value of all the harvested wood was greater than all the gold from California during the gold rush! Try to imagine what the landscape looked like after logging! It is much different than logging today. Many farmers moved in after the loggers to remove stumps and began planting crops. Often times, settlers would burn the woods to help clear the land. They waited until conditions were dry enough to get a good fire going. With all the settlers and loggers across Michigan, you can imagine what happened next. 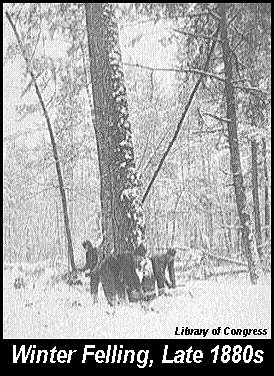 Michigan experienced terrible forest fires in the late 1800s. The most famous fire was probably the Peshtigo Fire in 1871, although most of that happened in Wisconsin. The same year, several large fires scorched two million acres in the Lower Peninsula around Manistee and Saginaw, and also in northeast Michigan and the "thumb". That year, Michigan Agricultural College (now Michigan State University) was threatened by wildfire and saved by student firefighters! The Thumb Fire in 1881 burned most of that area. In 1908, another two million acres burned. Many lives were lost in these fires . . . and a lot of forest, both young and old, was consumed. Mining created a large demand for hardwood timber for mine props and for charcoal to smelt iron. The furnaces of the Upper Peninsula burned about 30 acres of hardwood timber each day! The early automobile industry used a lot of wood in cars, as much as 250 board feet. That's an eight foot log, 27 inches in diameter for each car to come off the assembly line! 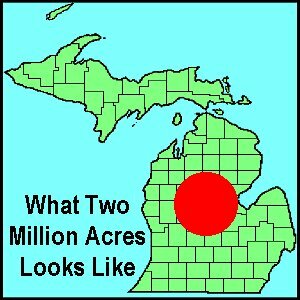 No wonder that Ford Motor Company once owned over a half-million acres in the U.P. Around the year 1900, Michigan citizens started to worry about the future of forests in Michigan. They were concerned about the way our forests were disappearing. This was the beginning of the Conservation Era in Michigan.